7 days of Engineering and Pre-Job Planning; 16 days of daylight operations to complete. A vertical multi zone gas well was drilled in the foothills region where BHP varies from 1,100psi to 7500psi. After completion operations, the producer decided to abandon the bottom zone with a bridge plug, move up hole and land the tubing. A competitor was contracted to snub the bridge plug and completion, who chose to use a conventional un-guided unit and install 10k bops. Surface pressure was 5300psi. As they snubbed in the hole after 3 joints, the lower stripping rams failed and pipe had buckled in the stack. A decision was made to attempt to pull out of hole, but the pipe wouldn’t move and personnel suspected a hydrate. Upon pulling, the pipe came free and launched, tagging top stripping ram and ejecting a joint from its connection. The well blew out, and eventually hydrated off. A freeze job was done to further secure the well and remove the snubbing jack. A 7-10 master valve was installed on top of the stripping rams to secure well and the freeze plug was melted. After attempts were made with coil tubing to fish pipe, Piston was contacted. We suspected pipe was folded inside the 7 icnh primary bop stack, and so the Operator wanted to remove tubing and safely secure well with 4 1/16 master valves, a 285 k Unit was rigged up with a 9 ram bop stack to ensure redundancy due to the delicate nature of job, workfloor height was 125’, a 6 15/16” mill was run on 2 7/8 slh90 drillpipe into stack, and pipe was milled out of 7 inch stack holding 7500psi, an E-line Unit was then mobilized to determine with a camera if tubing was fishable. Camera showed tubing was buckled across 4-10 x 7-10 crossover and across master valves. There were concerns over milling the offset tubing arose and that the mill would walkover and cut out side of gate valves. In that case, Piston designed a 4 inch convex mill with a 6 15/16 floating centralizer on the shank to keep the mill centered through valve. Pipe was then milled out of valves, a skirted mill was run after nd pipe was milled 6m past the master valve. 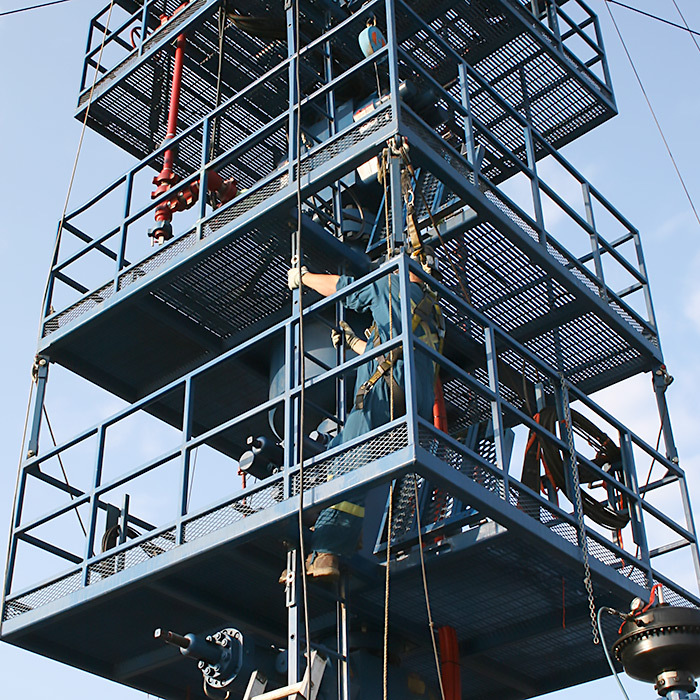 Eventually the well was secured and the rig demobilized until further programing was done.